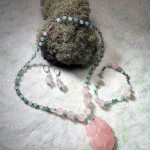 Gemstone Necklaces and Earrings, one with Bracelet. 42” of Silica and Quartz of Many Colors. SKU: . Category: Colors of the Earth. In India, where these stones came from, Quartz appears in a wide range of colors. And over 95% of the Earth’s crust is made of silica in its many mineral identities (please see Treasured Stones page). 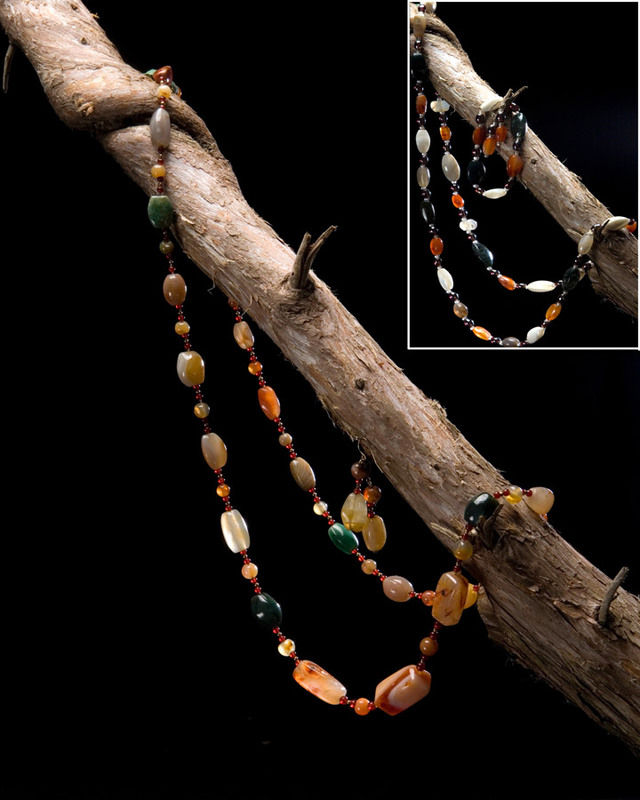 We can only speculate how they came to be called Beggar Beads, but with quartzite pebbles quite available in every stream, free for the taking, it isn’t hard to guess. 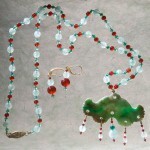 All the beads in the pieces pictured in the inset are made of silica: the small, clear glass beads, the iridescent ovals, the Asian Carnelian, the Agates of white or gray and finally, the very large opaque greenish Jaspars and are arranged sym-metrically. lf you decide this lavish length of silica is for you, you may choose between the two bracelets. One is strung on strong elastic for ease of putting it on. The other has a graceful Sterling clasp. For a pleasant surprise, hold it up to a light to see the hidden color of the iridescent ovals. 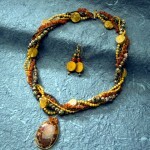 The jewelry composition pictured in the main part of the photo is quite adaptable. 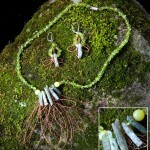 The variety of colors, shapes, sizes and translucency of the beads make it move with ease from dressy to casual. It can go from an opera length strand on white or beige velvet, (counting on the fashion upgrade of the tiny 14K GF beads and the frequent use of African Carnelian beads), or to being a generous 37” strand with a wool sweater and a pair of cords or jeans. I call that versatility, don’t you?